Ah, Zac Brown. He famously called out Luke Bryan’s “That’s My Kind of Night” as “the worst song ever”. And for the first track on Jekyll and Hyde, we have “Beautiful Drug”. Now, even though this band has enjoyed great success at country radio, Brown has said they have always played whatever they’ve felt like playing, even though they have the country label. There’s nothing wrong with that, there’s been room for different sounds in the country format. But “Beautiful Drug” is almost as bad as Bryan’s song and most of what passes for “country” now. It sounds like something almost anyone could have done. I considered doing a track by track review for this one. There are sixteen (including an acoustic version of “Tomorrow Never Comes” (not a bad song but didn’t need to be on here twice). This is a perfect example of why most people don’t buy albums anymore. Too much filler and the music is too much of a hodgepodge. I have no problem with artists wanting to do different types of music but it doesn’t work here, in my opinion. A big band style song (“Mango Tree” with Sara Bareilles) is followed by the heavy rock of “Heavy Is the Head” with Chris Cornell). There is another Jimmy Buffett style song a la “Toes” and “Knee Deep” (“Castaway”). The best song is the Jason Isbell cover “Dress Blues”, the only song Brown did not have a hand in writing. This band is undeniably talented and are known for their great live performances. But what may work in a concert doesn’t necessarily translate to a record. 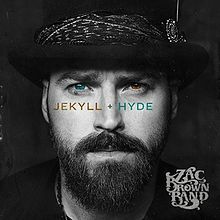 I can’t quite recommend the album as a whole but recommend these tracks: “Loving You Easy”, “Homegrown”, “Dress Blues”, “Heavy Is The Head”, “Junkyard”. Here’s hoping their next album is more cohesive. This entry was posted in CD Review. Bookmark the permalink.